There are many reasons you may want an exclusive use venue, but whether it’s for business or pleasure, if you’re booking the whole venue, it has to be perfect. 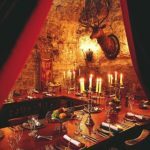 As you’d expect, Edinburgh exclusive use venues come in many shapes and sizes – here’s a selection of some of the best. Set in its 100 acres of its own parkland Gilmerton House is a haven or tranquility and calm. The doors of this gentrified home from home open to a large hallway set with cosy seating, which leads to the elegant dining room on one side or the large and comfortable drawing room on the other. The upper floors of the building are mainly dedicated to guest accommodation, but the first floor boasts a splendid wood paneled music room, ideal for parties or product launches. Accommodation consists of 10 en suite bathrooms, all of which retain their traditional feel whlist despite the modern facilities available. 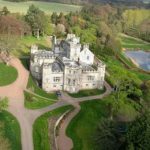 The grounds of the mansion included a sun terrace and beautifully tended gardens, and play host to numerous activities such as clay pigeon shooting, mini highland games, quad biking, falconry, archery and croquet. 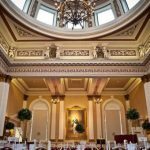 Edinburgh exclusive use venues don’t have to be castles or stately homes – The Merchants Hall, in Edinburgh City Centre, is a beautiful guild headquarters. The suite of rooms creates the perfect setting for large private gatherings covering a multitude of formats, from celebratory dinners and weddings to conferences for up to 150 delegates. The venue has three function areas, which can be hired individually, in combination, or as a whole allowing an event to flow from room to room or for break out rooms for business functions. The facilities include a lift to all floors, a ramp from street level, wi-fi and microphones, with the largest of the rooms having a built-in speaker system. There’s also a purpose built cloakroom, a dedicated concierge and air conditioning in the Court Room. 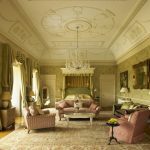 Considered a masterpiece of Scottish Renaissance architecture, Winton Castle has mastered the delicate balance between grandeur and warmth and comfort. The romantic setting is an obvious destination for weddings, but it lends itself equally well to corporate events, with a range of function rooms and overnight accommodation either in the castle itself or surrounding buildings. The venue has a range of team building and outdoor activities on offer with exclusive use of the estate, including hovercraft driving, clay pigeon shooting, laser tag and falconry for the adventurous or croquet and whisky and wine tastings for those who prefer a more sedate pace. Set in vast parklands, Dundas Castle offers the choice of elegance in the two elegant function rooms in the building itself, the medieval atmosphere of the 600 year old Auld Keep or the modern feel of the permanent marquee, which accommodates up to 200 people for banquets, receptions and product launches. The accommodation is comprised of 17 bedrooms, each with its own colour theme and, if romance should be in the air, there’s the opportunity to experience the outdoors with style whilst glamping or stay in the luxurious one-bedroom boathouse. 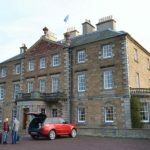 Archerfield is probably best know for Archerfield House, but it also offers a range of other accommodation to suit smaller groups for a more intimate setting and is only 40 minutes outside Edinburgh. The main building, built in the 17th century, has 15 double rooms and offers elegant banqueting facilities for up to 60 guests, whilst the Waterfront, set in 28 acres of land bordering the Firth of Forth can hold larger groups of up to 200. The Marine Villa is perfectly sized for family gatherings with 6 bedrooms set in a secluded beachfront location, together with the choice of the Boathouse accommodating up to 8 guests, the cottage having 2 double en-suites or one of the 9 lodges offering 3 or 4 bedrooms. A further 12 single bedroom Pavilion Suites brings the total accommodation to 70 bedrooms. On site facilities include a spa and two links golf courses, golf coaching and fitting centre.